The SEGA 32X is a add-on console for the SEGA Genesis (also known as the Mega Drive) which was released in 1994. It was created to boost the power of the Genesis, whilst also offering gamers next generation games without the prices -at the time it was released, SEGA had already announced their next true console, the SEGA Saturn, whilst Sony were also entering the console gaming market with their new Playstation machine. Both of these consoles were set to cost a lot more than the 32X, meaning people who already had a Genesis and didn't want to spend too much cash could go for the 32X upgrade. 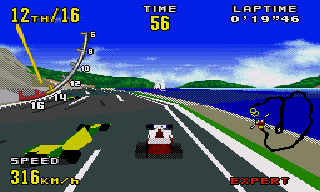 Virtua Racing for the Genesis. The game runs faster than Starfox, but the high cost of the SVP chip meant SEGA AM2's classic racer was the only game to use it. Initially SEGA of Japan had considered creating a new version of the Genesis that would boost its color palette (the Genesis had a color palette of 512 colors -compare that to the 32,000+ the Super Nintendo has) whilst also adding some new chips that would help developers with 3D games. SEGA had already played around with this technology in the form of the SVP chip. 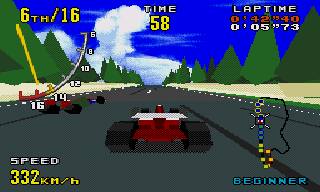 This chip was seen in the Genesis port of Virtua Racing, a damn racing game. In order to compete with Nintendo's Super FX chip (seen in games like Starfox), SEGA came up with a new chip that was placed inside the game cartridge. Unfortunately the SVP chip was expensive to produce, and the Genesis port of Virtua Racing cost a lot more than the average Genesis game. So much so that it was the only SVP Genesis game to ever be released. Back to the 32X plans. The idea of this new Genesis console was shot down by Joe Miller, a member of Sega of America's research and development team. Miller said it was a bad idea as the new console didn't really do much other than boost the colors. He and his team thought it would be better if the planned enhancements could come in the form of a add-on rather than a completely new console. As SEGA of America and Japan talked to each other, it was ultimately decided that the add-on console was the best way forward and this led to the start of Project Mars, the codename for the 32X. 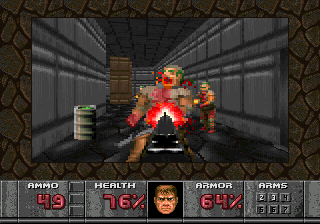 Doom was great on PC, but not so great on the 32X. Cosmic Carnage: worthless rubbish. Quite possibly the only power strip manufactured specifically for games consoles. A Mega Drive 1 equipped with a Mega CD and 32X. Three power supplies and two AV cables equals one big mess. When the 32X launched, the advertisements made it look like the machine just slotted into the Genesis console's cartridge port. Whilst that's true, what the ads didn't explain was the fact that the 32X also needed its own power supply. So to get the 32X to work at all, you'd need 3 sockets -2 for the machines, 1 for the TV. Add a SEGA CD on that and you'd need a ridiculous four sockets to get everything on. 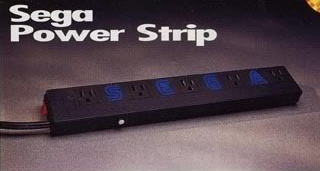 And due to the large size of the power supplies, you could still have difficulty getting them all into a strip -SEGA even made their own thing for this, called the SEGA Power Strip. 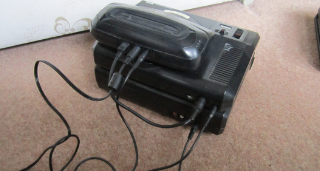 There were also issues with the cables -the model 1 and 2 Genesis have different AV cables, leading some gamers not being able to get their 32X consoles to work at all. After the launch, any hype for the 32X quickly vanished. New games for it weren't must-haves, whilst several games were merely upgraded versions of titles already seen on other formats. With the true next-gen consoles arriving in 1995, the 32X was ignored and sales were terrible. Most developers saw this and decided to cancel any games they planned to release on it, leading to the console being in a position of having more games scrapped for it than games that were actually released. Even SEGA had to forget about it -they'd suddenly got to start putting all effort into promoting the SEGA Saturn, as their new machine was struggling to gain ground against Sony's Playstation. Spider-Man: Web of Fire. A failure in every department. Especially the music. 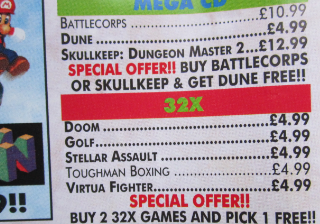 Stellar Assault for £4.99!? With hindsight I think we would have all got 10 copies at that price. 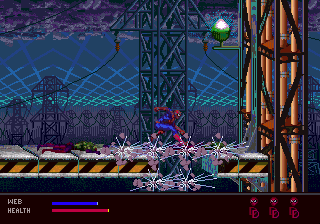 In 1996, the last game for the 32X was released: Spider-Man: Web of Fire. This was a terrible game and summed up everything about the 32X: stupid and unnecessary. The majority of gamers had ignored the 32X in favor of the upcoming consoles, whilst barely any Genesis owners purchased it. Looking back, former SEGA employees have admitted that the 32X was a bad idea, and the console is now commonly mocked by everyone in the video game industry. 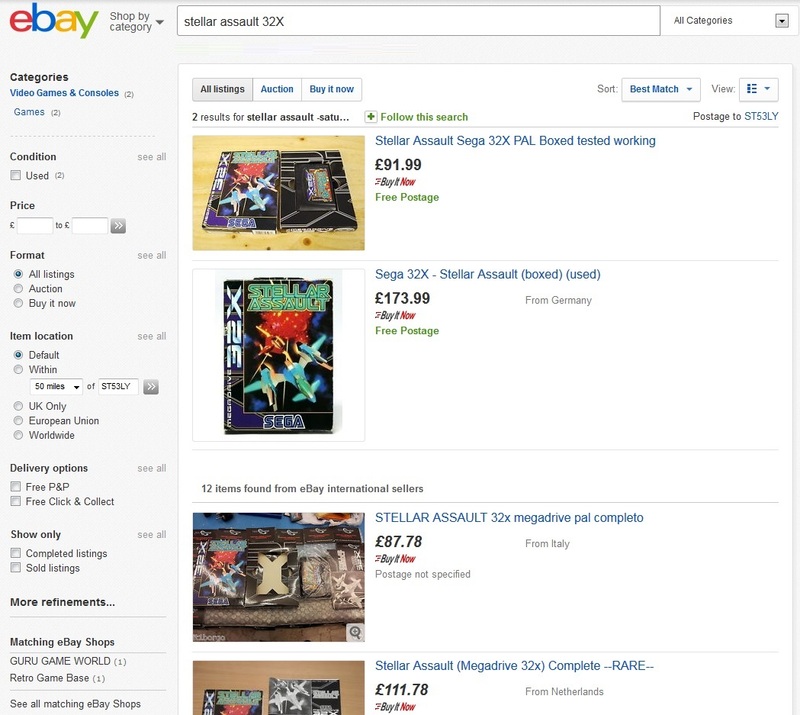 Prices for 32X consoles and games plummeted rapidly, all over the world -in the UK 32X software could be had for as little as £4.99 in some stores by 1998. In fact the 32X is seen as the point where SEGA's fortunes rapidly declined. After the 32X died, it didn't take long for the Saturn to follow it -whilst it had sold well in Japan, it lagged behind and Playstation and Nintendo 64 everywhere else, and it actually sold less units than the SEGA CD in America. The Dreamcast, released in 1998, was next, lasting just a few years before SEGA announced they were going to become a third-party developer, and no longer make any new consoles. Several consecutive years of debt had left the company financially drained, and these problems all started with the 32X. Looking back on it now, the 32X could have worked if it wasn't released so late. 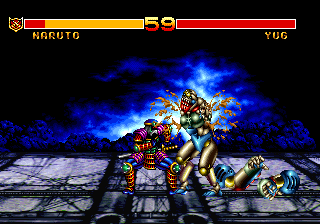 I think that if SEGA had somehow managed to get the 32X out in early '94 and had Virtua Fighter as one of the launch games, it would have done a lot better. Virtua Fighter was a very popular arcade game that had been released in 1993, and I'm sure a lot of people would have been willing to buy a 32X if it was the only way they could play the game in their own homes. Having the 32X out early rather than later would have meant SEGA could have concentrated more on it, rather than having to advertise both the 32X and Saturn at the same time. Q] What is this system called? A] In America, Genesis 32X. In Europe, Mega Drive 32X. In Japan, Super 32X. In Brazil, Mega 32X. Q] Can you play Genesis games on a 32X system? A] For the most part yes -any Genesis game can be played on a 32X. The one exception to this is the Genesis version of Virtua Racing. This game doesn't work at all when played through a 32X, apparently due to issues between the game's SVP chip and the 32X hardware. Q] What is the SEGA Neptune? A] A console prototype SEGA were going to release, but never did. I wish they had done as the Neptune was going to be a Genesis and 32X in one, making it a lot easier to store and setup than what we have. Read a little more about it at SEGA Retro. Q] Does the 32X work with the SEGA CDX? A] Yes, although you aren't meant to do it according to SEGA. The CDX (known as the Multi Mega in Europe) is a 2 in 1 console that combines a Genesis and SEGA CD into one small unit. Whilst you can use a 32X with it, it looks awful as the 32X is huge and doesn't balance very well in it. Q] Does the 32X work with the SEGA Nomad? A] No. For those who haven't heard of it, the Nomad is a portable Genesis console that was released in America. The 32X can't fit into it. Q] Are 32X games region locked? A] A lot of the games are region locked, for example, if you buy the American version of Knuckles Chaotix, you'll need an American machine. Some aren't locked though -I can play my European copy of NBA Jam T.E. on my Japanese 32X just fine. I haven't been able to find a complete list of what is and isn't locked.